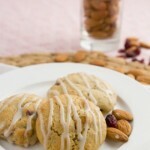 Sweet and tender sugar cookies with wonderfully crisp edges, filled with goat cheese, cranberries and almonds. Preheat the oven to 340F and line a baking sheet with parchment paper or silicon baking mat. Set aside. 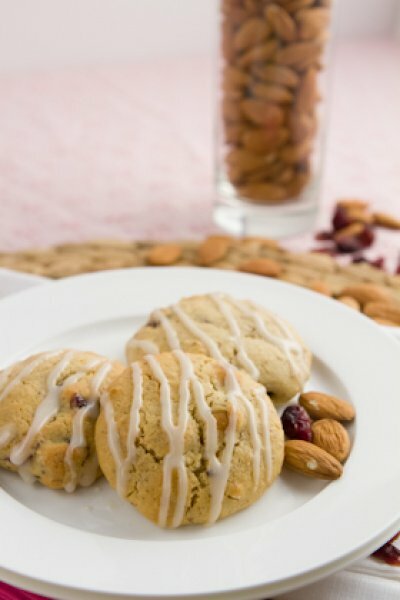 Coconut oil or other baking oils like butter can be used in place of grape seed oil. For the brown sugar, coconut sugar or demerara sugar can be used as a replacement if you’re watching your sugar intake and fructose rating of sugar. For a healthier powdered sugar, grind demerara or coconut sugar in your coffee grinder and use it as you would powdered white sugar.